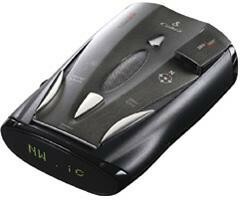 The Cobra XRS 9700 is an 11 bandÂ™ radar detector featuring Cobra's Xtreme Range SuperheterodyneÂ™ Technology. With this new technology, the Cobra XRS9700 has even more range than past Cobra models. The Cobra XRS9700 model also provides voice alerts-and includes a built-in 8 point digital compass. The Cobra radar XRS 9700 is also equipped with an alpha numeric display, which allows for far more detailed detection messages and a more complex signal strength indicator. The intuitive IntelliMuteÂ™ feature is also included, and will automatically mute the Cobra radar detector based on your speed. The Cobra detector radar responds to all types of radar currently in use by police, and provides 360 degree detection of all types of laser guns laser. The XRS-9700 also provides detailed messages from Cobra's exclusive Safety AlertÂ® and Strobe Alert warning systems. This Cobra detector radar is immune to the VG-2 and Spectre I radar detector detectors, and provides alerts when VG-2 and Spectre I are in use.